Swing is the vertical distance, usually in feet, between high and low tide. I always keep swing in mind when exploring the outer shores. Along with other factors like swell and period, swing influences what my day will be like by effecting surge up the beach and the duration of high and low slack tide. Slack tides are the calmest times on the outer shores. Since I’m usually exploring during an incoming tide I’m always thinking about the swing between low tide and the next high tide. This graph shows the relationship between low tide and swing when I’m out on the beach. 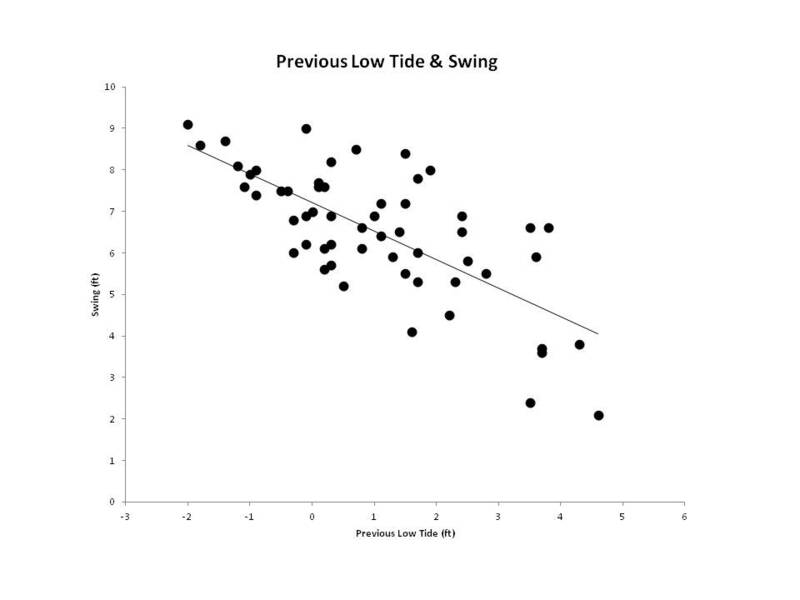 It turns out low tide is a pretty good predictor of swing. Variation in low tide explains over 50% of the variation in swing when I’m on the beach. High low tides are a good predictor of low swing. I like to be on the beach when swing is low. The smallest swings I’ve experienced recently were around 2 feet on February 21 and October 25, 2009. The biggest swing was over 9 feet, July 2, 2011.